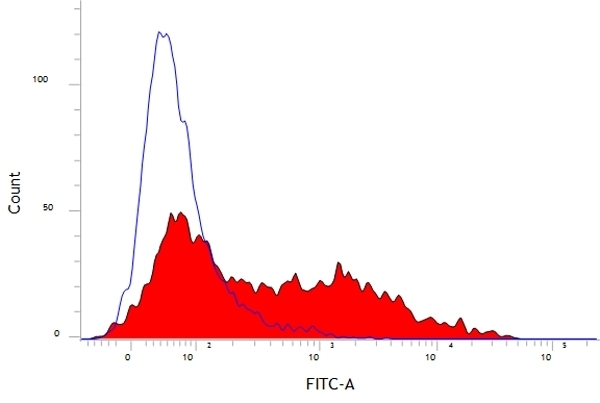 Figure A. FITC conjugated mouse anti porcine CD52 (MCA5974F) and RPE conjugated mouse IgG1 isotype control (MCA928PE). Figure B. FITC conjugated mouse anti porcine CD52 (MCA5974F) and RPE conjugated mouse anti porcine CD45RA (MCA1751PE). All experiments performed on red cell lysed porcine blood gated on mononuclear cells. Figure A. RPE conjugated mouse anti porcine CD45RA (MCA1751PE) and FITC conjugated mouse IgG21 isotype control (MCA928F). Figure B. RPE conjugated mouse anti porcine CD45RA (MCA1751PE) and FITC conjugated mouse anti porcine CD52 (MCA5974F). All experiments performed on red cell lysed porcine blood gated on mononuclear cells. 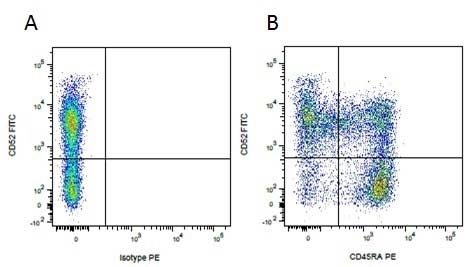 Mouse anti Pig CD52, clone 11/305/44 is a monoclonal antibody recognizing the porcine homologue of human CD52, a ~19 kDa antigen expressed by mature lymphocytes, monocytes and dendritic cells. Mouse anti Pig CD52, clone 11/305/44 was originally clustered at the 1st International Swine Cluster of Differentiation Workshop held in 1992 as SWC1 (Lunney et al.1994). SWC1 is the porcine orthologue to human CD52, expressed by most leucocytes including resting T-cells, monocytes and granulocytes, but is not expressed by B-cells, erythrocytes or platelets (Piriou-Guyzlack et al. 2008) & (Leitner et al. 2012). Porcine CD52, expressed at very much higher levels on monocytes than mature macrophages, and SWC9, expressed exclusively on mature tissue macrophages, have been used as markers of monocyte-macrophage differentiation (Sanchez et al. 1999) & (McCollough et al. 1999). Leitner, J. et al. (2012) Porcine SWC1 is CD52--final determination by the use of a retroviral cDNA expression library. Vet Immunol Immunopathol. 146 (1): 27-34. Lunney, J.K. et al. (1994) Overview of the First International Workshop to Define Swine Leukocyte Cluster of Differentiation (CD) Antigens. Vet Immunol Immunopathol. 43: 193-206. Seeboth, J. et al. (2012) The fungal T-2 toxin alters the activation of primary macrophages induced by TLR-agonists resulting in a decrease of the inflammatory response in the pig. Shao, L. et al. (2016) Tissue-specific mRNA expression profiles of porcine Toll-like receptors at different ages in germ-free and conventional pigs. Vet Immunol Immunopathol. 171: 7-16. Piriou-Guzylack, L. et al. (2008) Membrane markers of the immune cells in swine: an update. Sánchez, C. et al. 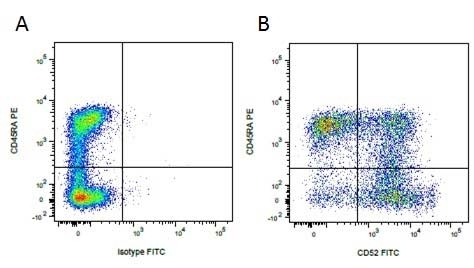 (1999) The Porcine 2A10 Antigen is Homologous to Human CD163 and Related to Macrophage Differentiation. Mccullough, K.C. et al. (1999) Intermediate stages in monocyte-macrophage differentiation modulate phenotype and susceptibility to virus infection.